In the heart of the beautiful Tirana, the capital of the surprising modern and dynamic Albania, the IFIP WG 9.4 conference took place. I was invited to present my work and also co-chair with Tim Unwin a paper and demo session regarding Equality and Safety issues with Digital Innovations. Tim and I wanted to mix up the session a bit to try out something unusual. 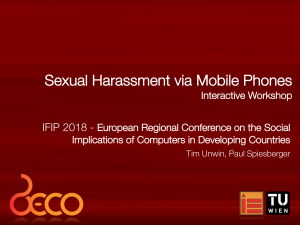 Before the conference, we started to discuss the issue of sexual harassment via mobile phones, after I read his blog post concerning the findings of their research. I proposed a, as we call it now, flawed solution to the problem. I designed a simple mobile application to register sexual harassers and warn victims. I wanted to start a discussion. Quite quickly all the drawbacks of potential abuse, legal implications, data management/ownership, etc arose. So, we got stuck in finding a good solution to empower victims of sexual harassment (via mobile phones) in developing countries. We then decided to bring the topic to the table of the conference and use the participants to brainstorm for other and foremost better solutions. The goal was to break my programmed engineering thinking and use the diverse minds of our demo and paper session track to come up with something much better. The goal was not a technology, but anything which could empower the victims. The topic was intentionally set very broad to not limit the flow of ideas. This was also challenging, since there were no boundaries and many questions arose during the brainstorming. Furthermore, solving this complex in just workshop is unrealistic, but we were willing to try our best. create an anonyms social network for victims to connect with others and find help. To visualize the harassment to show that this is a big issue and to illustrate that victims are not alone. Make it easier for victims to defend themselves by offering information material on how to legally fight back. Illustrate the rights of every person. When harassed by mobile phones, then the harassment is actually documented by call logs and text messages. This offers a new way of using this as a prove of harassment against the harasser and visualize the attack. Translate sexual rights and women rights into pictograms and make them accessible to everyone. Better illustrate that sexual harassment is not the fault of the victim and that they have a right to dignity. Provide a quick help by offering options to victims to protect themselves. A place where victims can share their story anonymously. To make it first possible to talk about the incident in a safe environment and also help others to understand that they are not the only ones going through such a difficult time. Provide call centres with no charges and ensure anonymity. A self-defence Drone you can launch to film your harasser and document the incident. Better offer statistics about incidents to trigger a discussion and create awareness. A “one button click” to connect one victim to another to reach out for help and understanding. Create a SMS based one/two-way communication with empowering and motivating messages. Also offer a smart phone application. Implement a general filter to block harassment content entirely form your platform. Have a “Right to delete” content on the Internet. Many more issues, problems and ideas were discussed and mentioned. The possibilities and challenges are there, the sensitive topic of sexual harassment is too often ignored and our workshop underlined that we need to put a spotlight on this issue. ICT can do good, but also too often bad. It is our responsibility to also discuss the dark side of the technologies we promote and to be aware that ICTs are not always shiny and golden. I would also like to thank Endrit, the conference chair, who gave us the opportunity and a big thank you to Tim, for supporting me in my work.